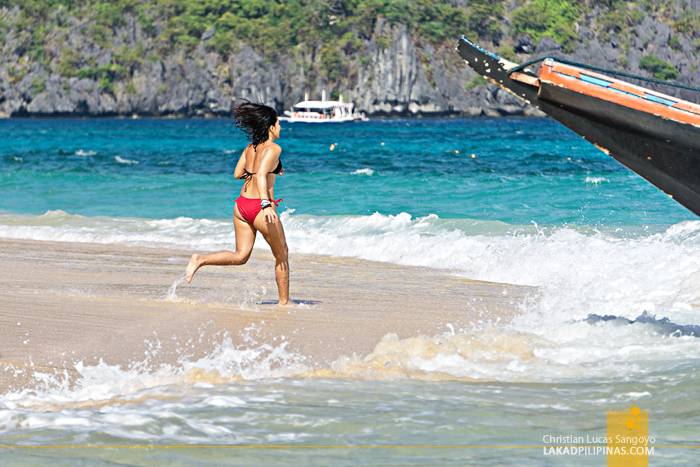 Everyone in the group, except M, had tried the island hopping activities in El Nido. We initially thought of passing up on it, but we considered doing it again for the sake of our friend. Well, it’s his first time on this part of Palawan and we thought we’d treat him to a combo island tour to maximize his island hopping experience. 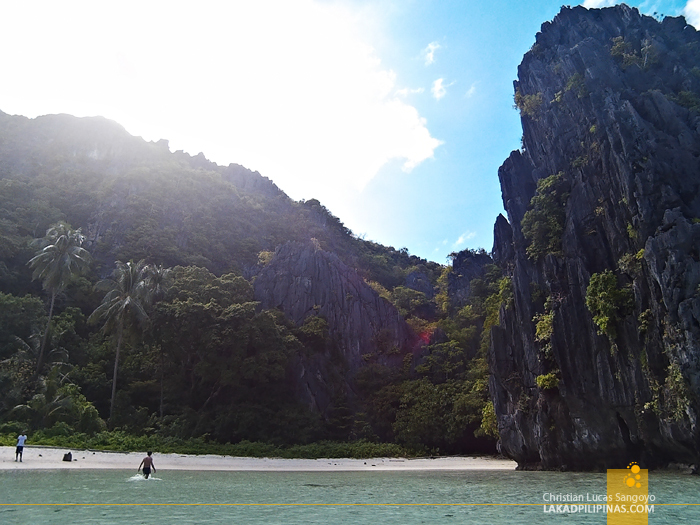 El Nido has four island hopping options grouped into Tour A, B, C, and D. The two most popular routes are Tour A and Tour C. If you have limited time like us, you can actually combine these tours—choose where you want to go and cross off those that doesn’t interest you. Already familiar with most of the islands and beaches on the list, that’s exactly what we did. 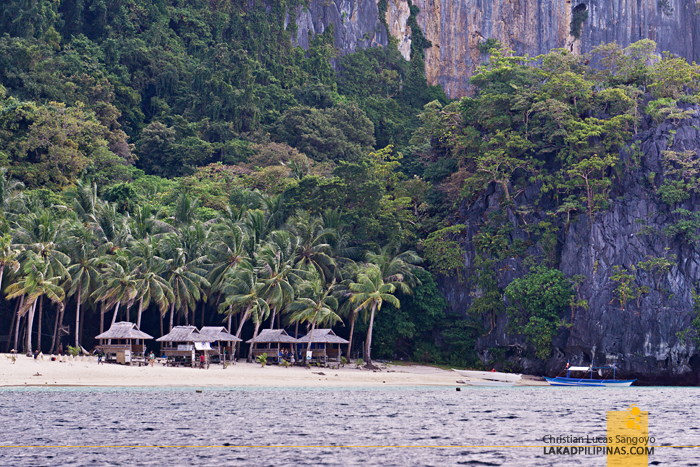 As with all our tours in El Nido, we booked our island adventure right on our lodging, Northern Hope Inn. Tour A costs PHP1,200.00 per person and Tour C is at PHP1,300.00. 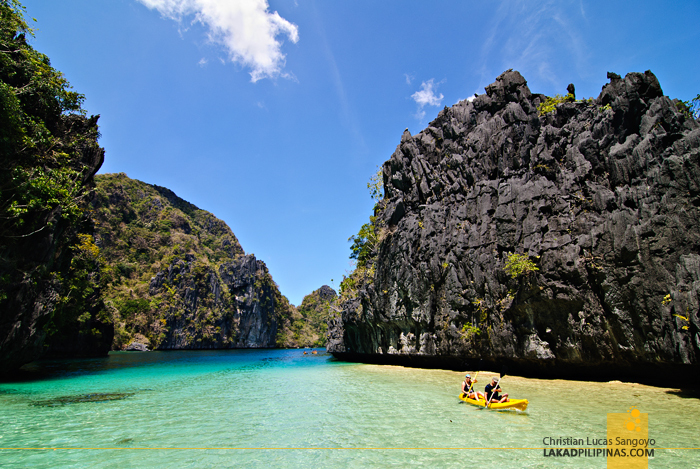 The Tour A & C Combo is pegged at PHP2,000.00 per person, a bit more expensive but you see the best of both tours. It’s exclusive of the PHP200.00 per person Eco-Tourism Development Fee, but is inclusive of lunch, mask, snorkel, life vests, and a guide. Named after seven soldiers who used to live on this beach, Seven Commandos Beach was our first stop for the tour. It’s usually the last destination on the itinerary but our boatman decided to drop anchor here first to avoid the tourist crowd. And he was absolutely right. Besides one group of visitors, we were the only tourists on the beach! 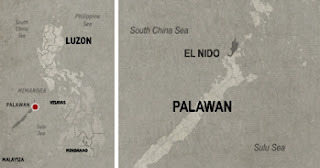 Seven Commandos isn’t actually located on an island, but is part of the El Nido mainland. Only thing is it can’t be reached by land, only by boat. 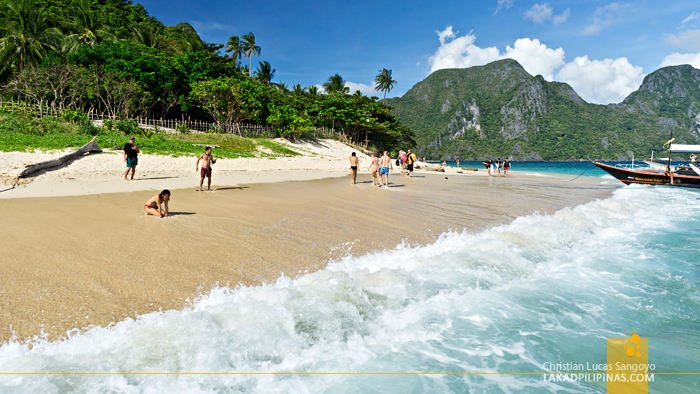 It’s right in between two more beaches, Ipil Ipil and Papaya Beach, and further away, Bacuit Bay and Corong Corong. 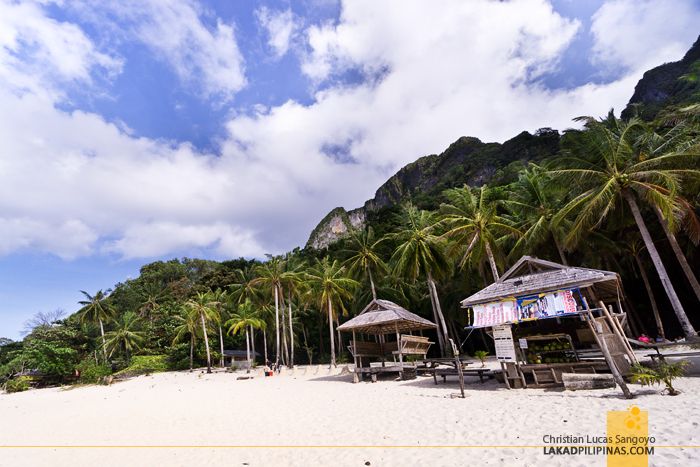 The beach, bordered from the town by a towering cliff lined with coconut trees below, has about three hundred meters of fine white sand, so fine in fact that during windy days, the sand could really sting when it hits you. Its waters is very swimmable, but our boatman recommended the cordoned swimming area for such. 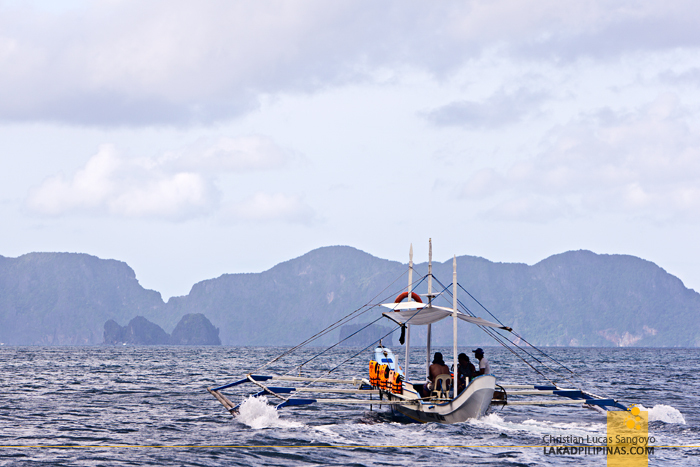 Heading westward, our outrigger boat roared into Miniloc Island. 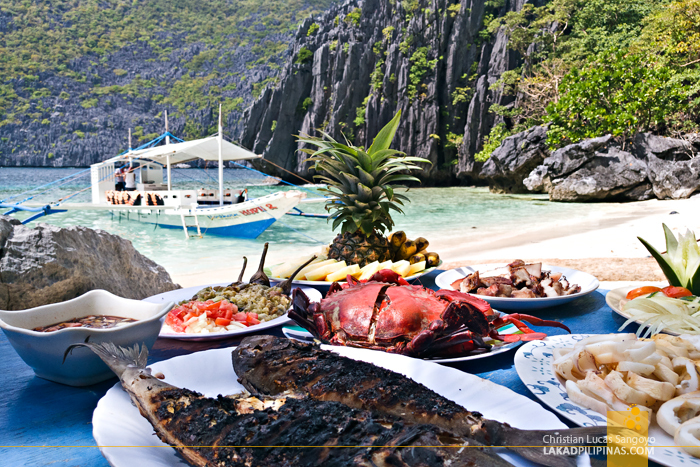 This is actually where one of the more expensive resorts in El Nido is located, eponymously named, El Nido Resorts – Miniloc. Very creative. 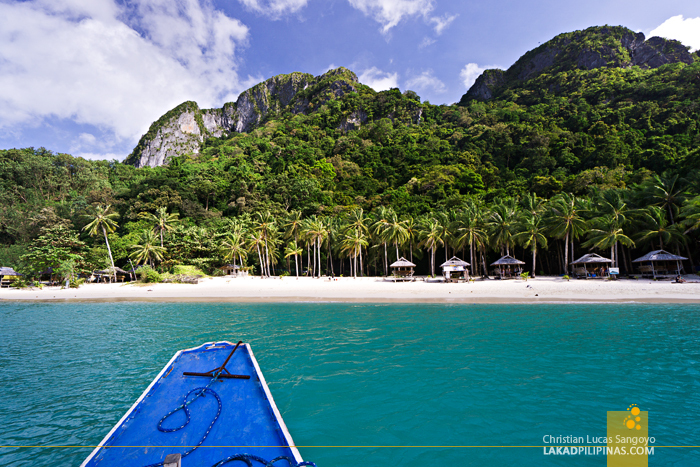 Miniloc is also where El Nido’s iconic lagoons are located. We went to the big one first. 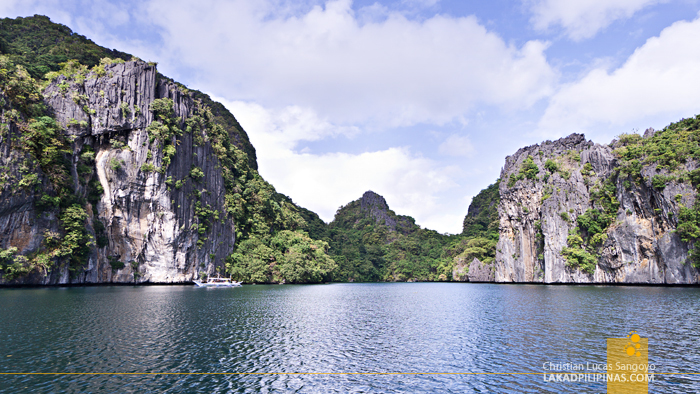 Hidden in plain sight, jagged karsts hiding it in view, the lagoon opened to our boat like magic. The water on the entrance was quite shallow, and tourists are even allowed to swim here before. It is, however, littered with clumps upon clumps of black sea urchins. It’s probably one of the reasons why they now prohibit people from swimming. You can still kayak here though, if you really want a much more personal experience with the lagoon. Some meters in, the water turns a darker shade of blue, meaning the seabed gets deeper. How deep? Like fifty freakin’ meters deep. Tourists are also prohibited from swimming in this area due to strong currents. 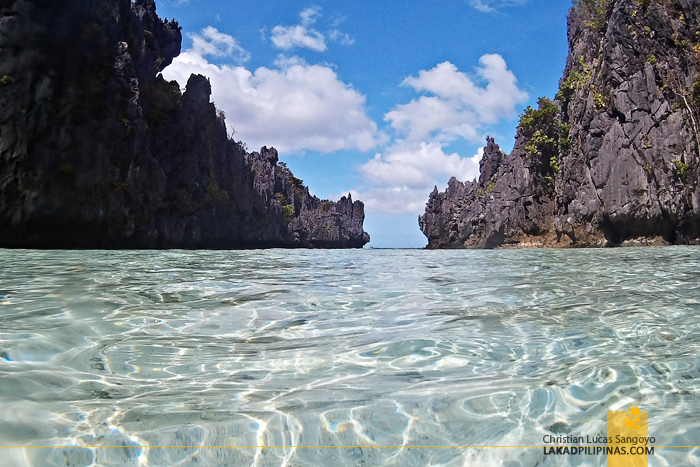 The view, deep aquamarine waters surrounded by soaring limestone cliffs, was definitely out of this world, especially for first-timers. 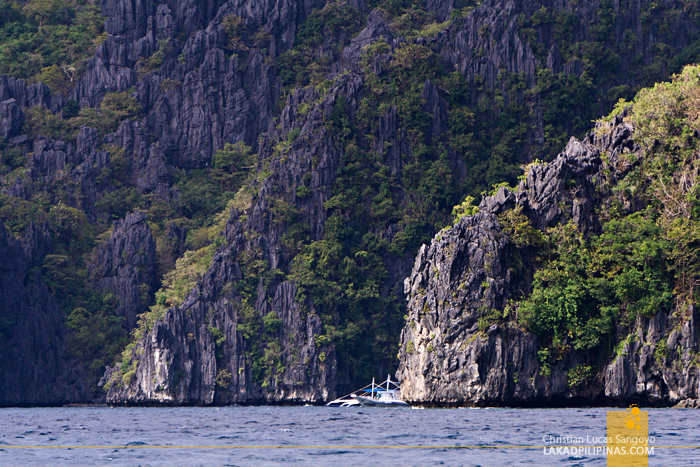 It kinda reminds me of the Kayangan Lake in Coron, but on a smaller scale. We exited on a different route from where we came and rounded upwards towards the Big Lagoon’s little brother, the Small Lagoon. The mouth of the lagoon was filled with docked boats and canoe hawkers peddling drinks and snacks to those onboard bigger boats. To get to the main lagoon, one can either swim for about a hundred meters, or ride a canoe to the opening of the Small Lagoon. That said opening is just about a couple of meters wide, just enough to fit a small hand-paddled boat. 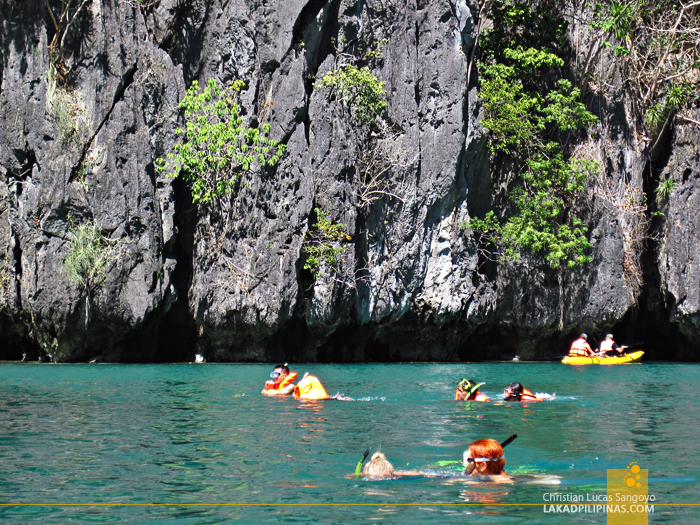 Inside the Small Lagoon, the vibe is much more intimate—the karsts surrounding the waters are grouped much tighter. The water depth, like the previous lagoon goes down quite deep. Off one side of the cliff, a small cave illuminated by a natural skylight can be accessed by visitors. The floor is also submerged in water, so you can’t actually stand inside. It was already midday when we docked at Calmung Island’s Secret Beach, located about half a kilometer from the famous Matinloc Shrine—which we actually bumped off our list. The Secret Beach (not to be confused with the other Secret Beach, where you need to enter a small opening on a cliff) isn’t really so secret since it can be easily seen by boats plying the Tapiutan Strait. 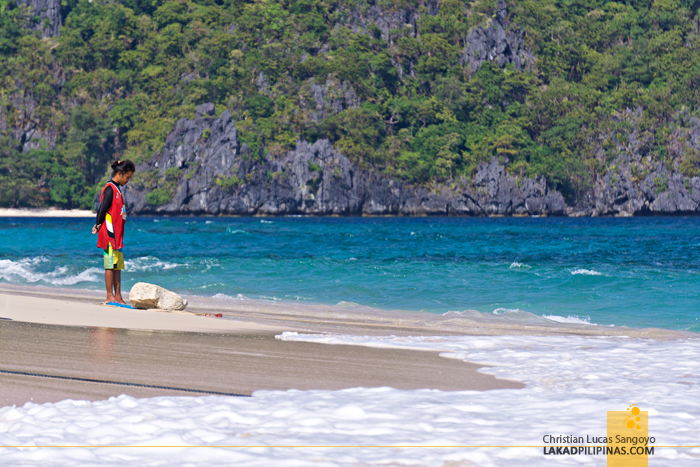 It’s a small pocket beach, about sixty meters in length, and I guess, isn’t really the most popular lunch beaches in El Nido. And that’s actually more than fine with us since we have the whole tiny beach to ourselves! 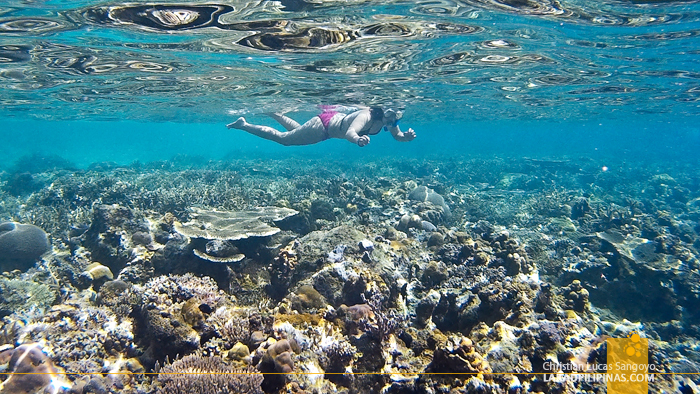 While our boatmen were preparing our lunch feast of grilled squid and fish, pork liempo, eggplant ensalada, giant crabs, and fruits—basically the same lunch we had on our Linapacan island hopping tour—I dove down the water with my snorkel and fins. 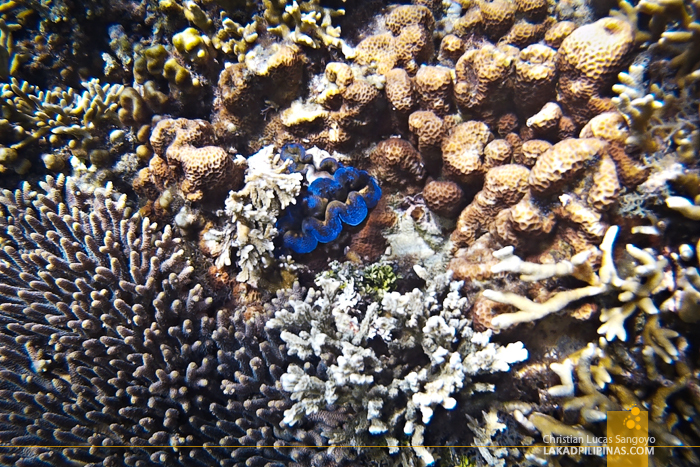 I was quite surprised with what I saw, the seabed was just exploding with corals, and I didn’t even have to go that far from the shore! 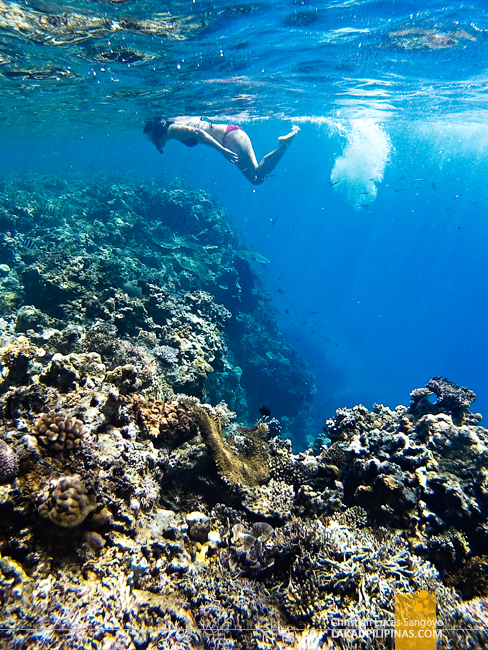 Continuing my underwater adventure, our next stop was a small reef adjacent to one of Matinloc Island’s soaring cliffs. Not heeding my grandma’s advice of not swimming after a meal, we dove down El Nido’s clear water and explored an underwater garden teeming with colorful corals. 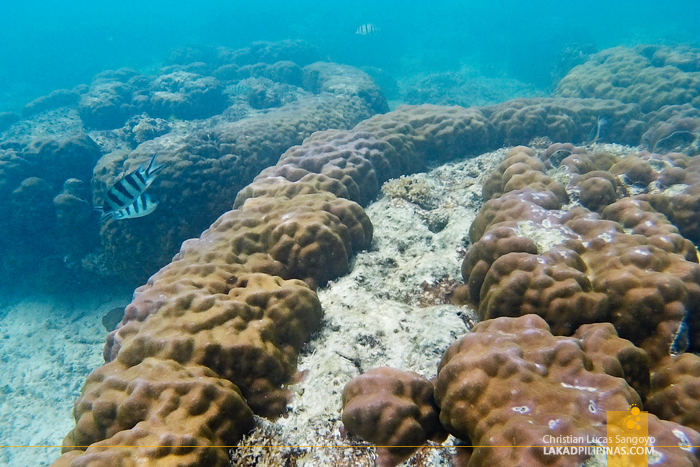 The water was quite shallow, so we were careful on some parts not to brush against the corals. Besides the hundred percent clarity, there was absolutely no current! 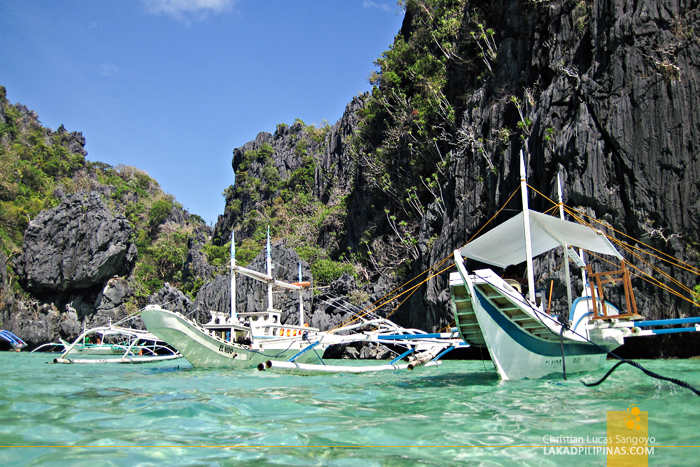 It was one of the most beautiful, if not the most beautiful snorkeling areas in El Nido I have seen yet. We swung around the east side of Calmung Island to check out its Hidden Beach. Now, this one truly deserves its moniker. 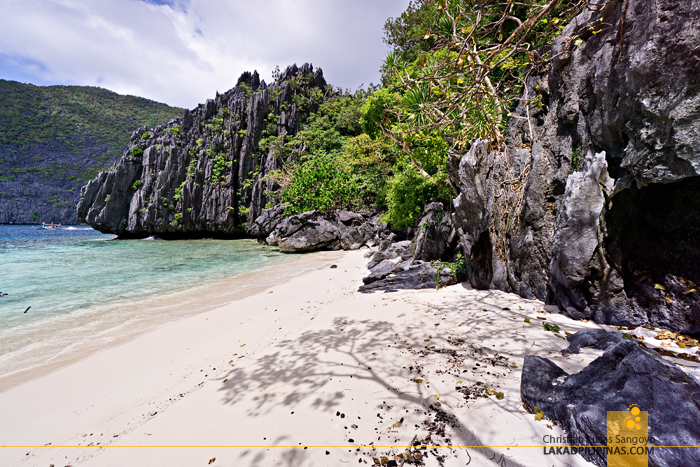 Unlike the Secret Beach, which can easily be seen from the sea, the Hidden Beach is really, well, hidden. 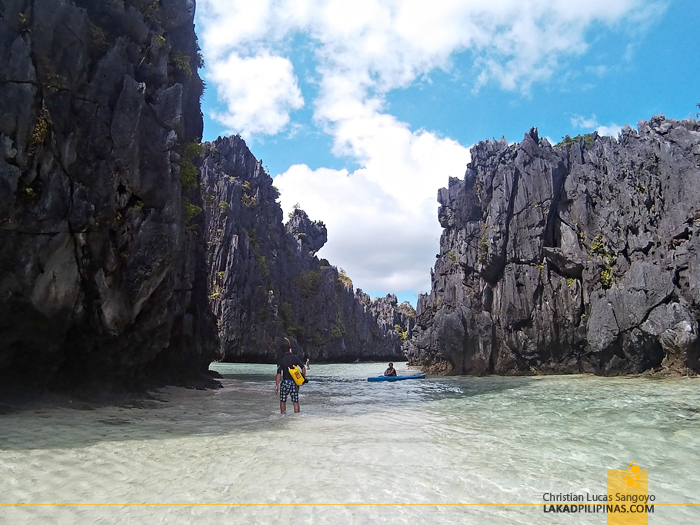 To get there, you’d have to jump off the boat—which during our visit was really rockin’ and rollin’—swim a few meters towards the craggy rocks, and walk on a hip-deep rocky channel bordered on both sides by sheer limestone walls, then the Hidden Beach opens into view. It has shoreline of about fifty meters fronting a shallow cove. 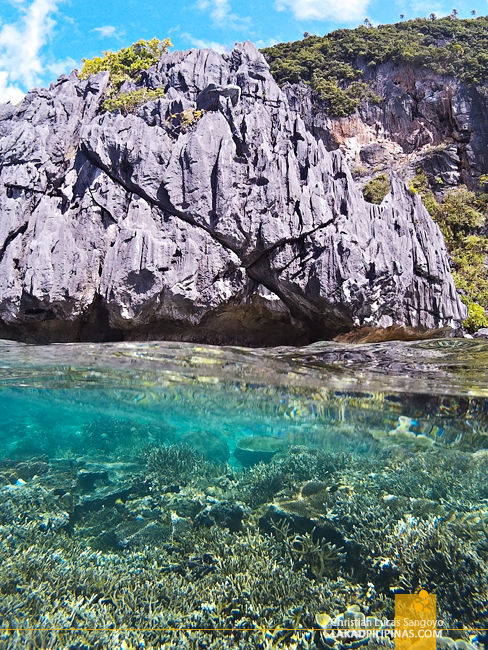 During my first visit to El Nido, I was able to snorkel along this area and found it to be home to quite a few clown fishes. Our last stop before going back to the mainland was Dilumacad Island. 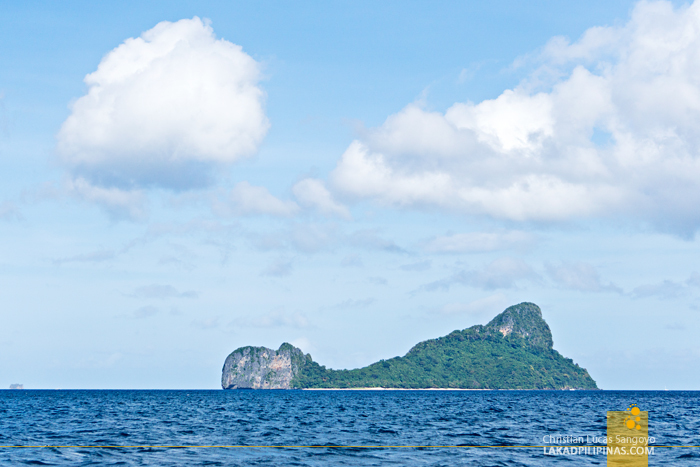 Popularly known as Helicopter Island due to its shape when viewed from the boat, it sports of a half-kilometer long white beach. In my opinion, it actually looks more like a sleeping dinosaur with a hump near its behind, lol. It kinda reminds me of Denver the Last Dinosaur cartoon show when I was a kid! The waves were really slamming when we arrived on the island and it took great effort for our boat to dock and for us to alight. We sank down its creamy sand as we struggled to get to the shore, the waves pushing us as we trudged forward. The inland part of the island was fenced, but the whole stretch of the beach can be enjoyed by tourists. On my first outing here, we snorkeled along its water, following a sea turtle as it glided past us towards a few giant clams. 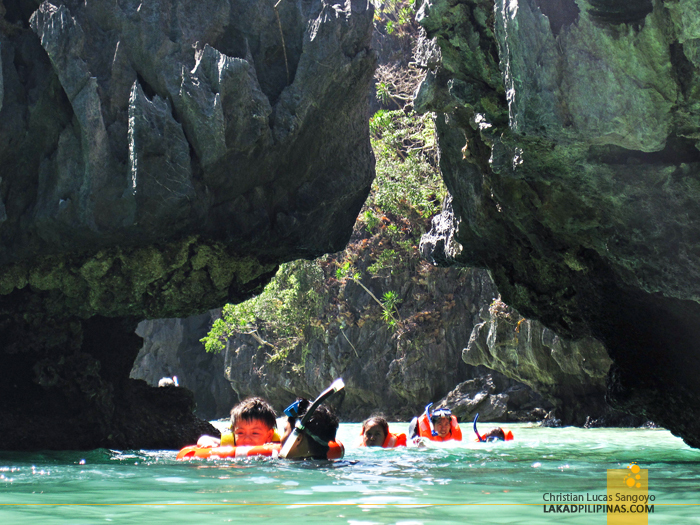 ~ OUR EL NIDO ISLAND HOPPING WAS MADE POSSIBLE WITH THE ASSISTANCE OF NORTHERN HOPE TOURS. VIEWS & OPINIONS ARE ALL MINE.